Popular Echium plants and species available for sale include Echium candicans, (syn fatuosum) and wildpretii. Some have common names such as ‘Pride of Madeira’ and all are loved for the tall flower spikes. With over 60 species from areas as diverse as North America and South Africa echiums provide us with a wide range of very useful ornamental plants, and a few invasive weeds as well (echium plantagineum is widely called ‘Pattersons Curse’ in South Australia). Echiums are stand out plants for the border for a very interesting display, echiums tend to to be to large for all but the biggest planters. Echium pininana is referred to as the ‘Tree Echium’ this one can grow its flower spike to 4m. Echium wildpretii is from the Canary Islands and will grow to 2-3m. All echiums require a well drained humus rich soil to do their best. It is a good idea to cut off flower spikes before they seed where possible. 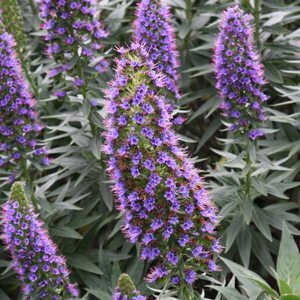 Echium candicans is known as ‘Pride of Madeira and grows from 1-2.5m with nice purple flowers spikes. Echiums flower from spring through to summer. Echiums are reasonably drought tolerant and do not like frosts. In general light pruning to tidy up spent flower heads is about all that is needed. Hard pruning is not recommended as they do not shoot from old wood. E. wildpretii – This requires a dry or well drained soil in winter, wonderful crimson flower spikes and silvery green foliage. This is a biennial and will flower in the second season. E. candicans – This is the widely grown species with masses of purple flowers from spring through summer. Again a well drained soil and a frost free position. E. pinninana – A giant species also known as Canary Island Viper’s Bugloss, to 4m in height tall flower spikes of a dark blue. Handles moisture more than other species. E. fastuosum ‘Duxfield Blue’ – Lower growing with purple to blue flowers.